A cucumber is standing in front of a tower of ice in the picture. What does this mean? 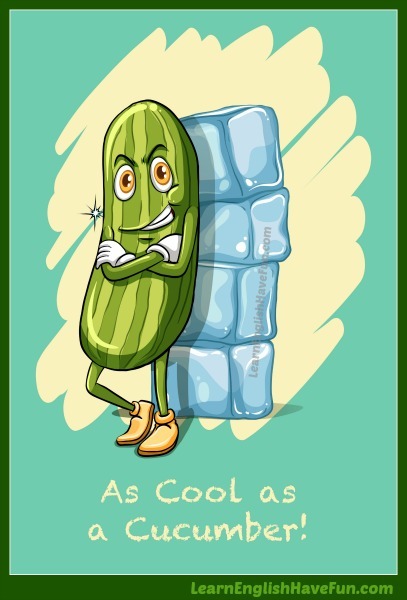 As cool as a cucumber: calm and relaxed (especially in a difficult or stressful situation). A cucumber grows on a plant. They are part of the same plant family as watermelon, squash and pumpkins. The inside of a cucumber is a lot cooler (in temperature) than the air outside it. We often talk about people who are angry or upset as being hot—when you get angry your breathing increases, your body starts pumping more blood and the pressure rises and so on. When you're calm and relaxed your heart beats normally, you're not upset and you aren't worried. Since a cucumber is something that stays cool on the inside this is where the comparison (as cool as) came from. My boss is as cool as a cucumber even when he speaks in front of hundreds of people. Even though she'd just lost her job, she came to the party as cool as a cucumber. I would have died but my friend was as cool as a cucumber when the mean girls started teasing her about her old dress. I prepared for the test for weeks so I wasn't nervous beforehand—I actually felt as cool as a cucumber! What an amazing gymnast! She's as cool as a cucumber when she performs the most difficult skills on the balance beam. Trust me. You're not going to be as cool as a cucumber when you give birth to the baby! It was funny—the bride was as cool as a cucumber at the wedding but the groom was a nervous, crying, sniffling mess. This Thanksgiving I was as cool as a cucumber. We had the meal catered and the only thing I prepared was my specialty apple and pumpkin pies. I used to get so nervous before meetings but after learning deep breathing techniques I'm as cool as a cucumber. I don't understand how you can be as cool as a cucumber during turbulence on the airplane. I'm so nervous and anxious! I highly recommend you hire Jessica. One of her best strengths is that she's as cool as a cucumber whenever we have large conferences. Since I attended all my classes and started studying weeks in advance I was as cool as a cucumber during my final exams. My sister was as cool as a cucumber at her wedding but her fiance was a complete nervous and crying wreck! Did you like this idiom? If you want to know when I add new idioms to this website, be sure to sign-up for my free newsletter. Write a sample sentence or two in the comments box below to practice your English. This will help you more easily remember this idiom in the future.